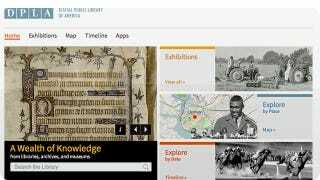 After two and a half years of development, the Digital Public Library of America finally flipped the switch on and opened its website at DP.LA. Collecting items from institutions cross the country, the library has already collected more than two million items in its searchable database. And that's just the beginning. In addition to regular searches of the kinds you're probably used to, you can view DPLA results as a timeline or a map. The DPLA also has an API so developers can dbuild their own tools for browsing the huge collection.